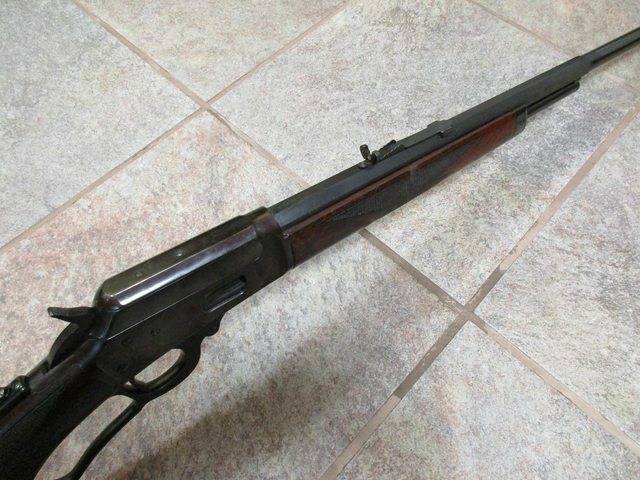 About 10 years ago I sold off a major amount of my pre WWI era Marlin lever action repeating rifles. 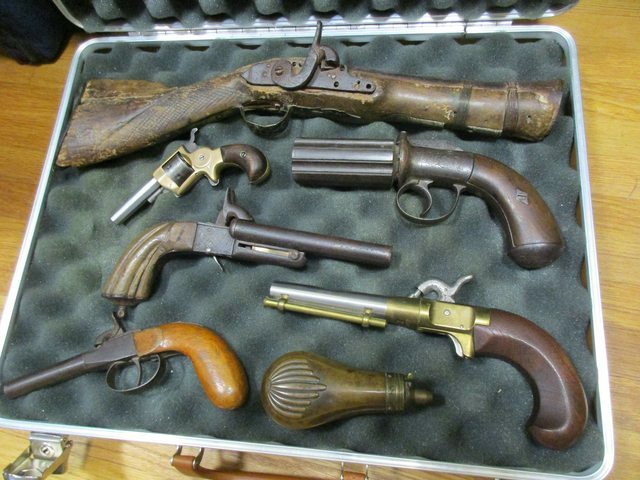 Kept a handful, but the rest went towards funding my 1800's single shot rifle addiction, especially Marlin Ballard rifles. 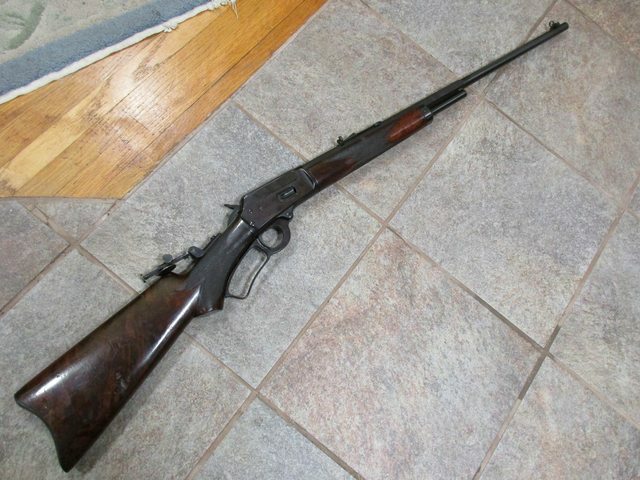 Then Thursday night a friend calls me to say he has a friend who wants to sell his '94 Marlin in .25-20. I told him I wasn't buying them anymore, but he insists I look at this one and sends me a picture. I suddenly got that feeling I better make an exception, so we arranged to go see it yesterday. A deal was struck with the seller, but he also said he needed to make sure it was all "according to law", so we're getting together Monday morning at a local dealer to do the paperwork. It's a special order deluxe rifle, with longer 26" half octagon barrel, and deluxe pistol grip stocks, with shotgun style stamped steel buttplate. Factory checkered, and original sights. 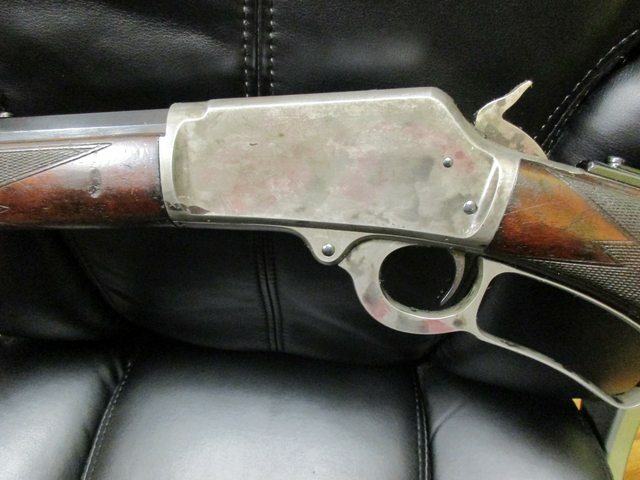 Beautiful condition, with just a few small marks on the buttstock. Great bore too, which I don't see often on old .25-20 calibers. Serial number indicates 1907 MFG., so no letter for one this era. So I guess I wasn't really done with repeaters. Re: Thought I was done. That is well worth the paperwork! I think you made the right decision. That's a real beauty! Glad it found a good home. Wow, what a trophy! Glad it found a home where it will be appreciated!! Yep. A true work of art, AND it puts the 'fun' in functional as well. Looked at the picture before reading the text and ......gulp! 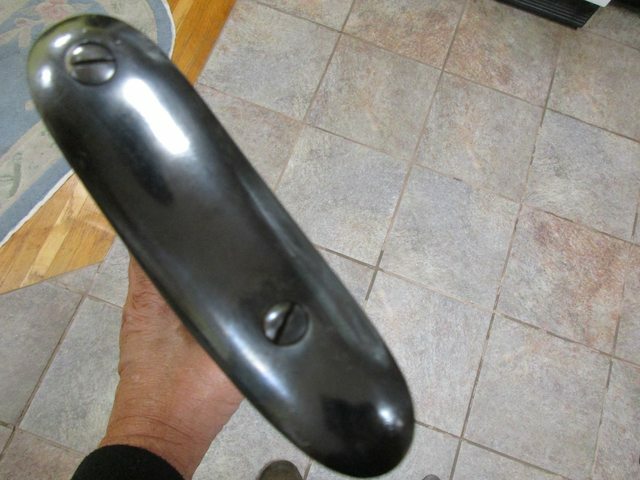 ....almost choked.....you just don't see too many with those options and like you said, with excellent bore condition. But...on the other hand....and you know this.......high dollar guns were not taken out and all beat up and the original owner, being able to afford a gun like that, most likely had a gun bearer who would clean it at the end of the day.! The wood looks like it's above the standard deluxe wood....probably 2x. Any color left? And ..........and........ can I have it? Val, Reckon that fine rifle will be loved ,but will it be shot??? Welcome back to the Dark Side, Vall ! . On second thought post before you let them sniff each other's bores in case they get into a fight! I shoot all my guns Jerry, and how much depends more on how well they shoot, rather than how nice they look. If this .25-20 happens to be a tack driver it will see lots of shooting time! Made arrangements to meet Monday when the gun shop opens. Then I'll be driving over to another old friend's home to assist him in figuring out what he has for guns, as he wants to sell his small collection. Once I get home I'll get more pictures and post them. I'll slug the bore also, so I can see if either of my .25 caliber molds will work. Have some bullets that might also work. But totally out of brass or ammo as I gave it all to a friend, but kept the dies and molds. Didn't plan on getting into another .25-20 again. A little, but not very darn much color. I agree on how high end guns were kept or used. Most people paying the extra money for a high end gun would take very good care of it. 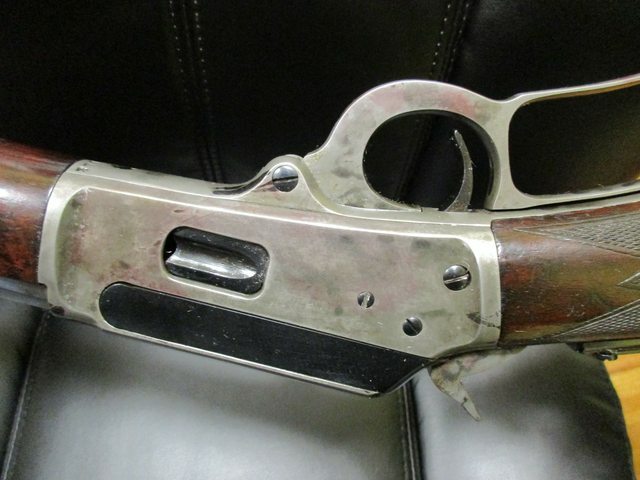 Most I've seen were still in nice shape, and it's rare to see a high end gun abused or well worn. The few marks on this high grade wood will likely just stay as they are. Too much original finish to even think of addressing the marks, or refinishing the wood. A couple battle scars will just have to be lived with. Really lovely piece, Vall. Congratulations. A .25-20 of any description has been on my list for decades, but no soap. This one was out in Hillsboro, Or. Bill. Wonder how many others are sitting in people's closets undiscovered? Picked up the Model '94 Monday, and after a complete strip down, and cleaning of old gunk, it's back together. Nothing unusual inside, as it appears to look almost new inside. Bore looks pretty good, although dark with good rifling. Must have been too excited when I first looked at it as I missed the front sight! Thought it was a simple Lyman combination sight, but it's a #8 Lyman windage combination sight! Never owned one of these before and they're super cool! The wood appears to be 2x or 3x and has a hairline crack in the wrist on the left side. An old repair, and very solid. I might address it to make it less visible, but it's so small I may just leave it alone. I am going to pull the lever and hammer off and put some Naval jelly on them to see if there's case colors left under the bluing. If there is I'll stop there. If none left I'll send off lever and hammer to Al Springer and have him color case them again. Put an old tang sight on it for now, but will try to locate a proper Marbles or Lyman tang sight for a '94 later. Barely had it 36 hrs., so not sure how it shoots yet. Still need to slug the bore and see if any of my molds drop the right sized bullets. Then load up some ammo and take it to the range. A couple of minor scars on the wood of an old rifle can give it character. That is a good looking rifle. Congratulations. I couldn't agree more. If the wood was perfect I'd wonder about when it was made. Of course Marlin serial numbered their wood to the guns, so easy to know it matches. But wont tell you if it's refinished. Talked with Al today, and he'll refinish the cased parts of there's no finish left when I strip the bluing with Naval jelly. I think you stumbled onto a great find! That is a fine old rifle. I hope it shoots as good as it looks! 25-20 is one of my all time favorites!! Wow! Super find. That looks like one that will be a lot of fun to shoot. Good score! When the Color Case Hardening is done, it should look even better. Case hardening is beautiful when done well. Thanks! Yes, Al's color case is about as good as it gets. He's doing a Rolling Block project for me right now, and happened to call me yesterday. So we talked about this one and I'll have him make it look proper soon. And by chance I had a friend call yesterday and ask if I'd sell a briefcase of old clunkers for him. 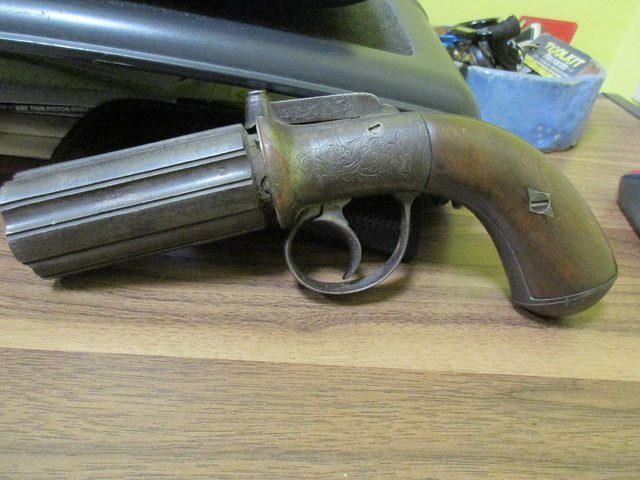 I may hang onto the Pepperbox, just because it's cool to me. The rest have little value. 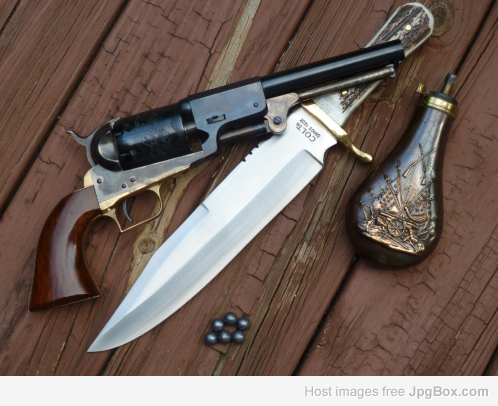 Maybe the brass framed revolver, since it's a .22 short. One in the bottom right is a modern repro. The Pepperbox is fully engraved and has Birmingham proof marks on the barrels. This should maybe help clear up the question as to whether Marlin or Winchester came up with the .25-20 first! 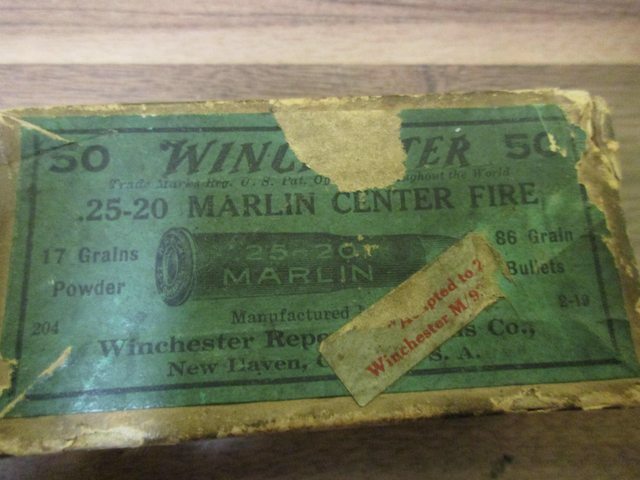 Notice the box is Winchester ammo, but marked ".25-20 Marlin". And then a label applied by Winchester stating, "Adapted to .25-20 Winchester M/92". 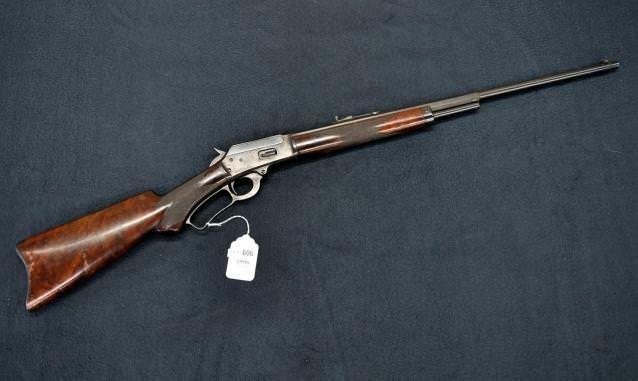 Would guess if Winchester came out with the .25-20 first, they would add a label saying "adapted to Marlin 1889/1894? I just picked up a deluxe '94 Marlin so I was digging through my ammo looking for .25-20 ammo or cases to reload. Found two boxes marked .25-20 Marlin. The other is UMC. So I still need to find cases, since I wont be shooting these! Thanks! I thought I recalled having one, but was surprised when I found two in my ammo collection! Isn't it great when you forget you have something really cool, and then find it? Yes, it sure is! Way better than knowing you have it, but can't find it. That's my usual M.O.! I pulled that Pepperbox apart today to see why it doesn't revolve. It was missing a link that draws the hammer, and engages the pawl to turn the cylinder/barrels. I heard something rattling around inside the grip frame, so I pulled the grips too. Bingo! There was the missing link, and a piece of broken pin! I can make up a new pin, and reinstall it with the link, and it should be working again! Super nice all around, thanks for sharing. Man! You must live right! That would never happen to me. Whenever I'm in an outta the way shop I always scrutinize the ammo shelves looking for 25-20s. If there is a box I grab it. Last box I found was about 4 years ago, Rem 86gr sp- set me back 64 bucks! .25-20 ammo is nearly impossible to find these days. I'm going to resize .32-20 brass to make up loads for the '94 Marlin. Rare as hens teeth for sure! 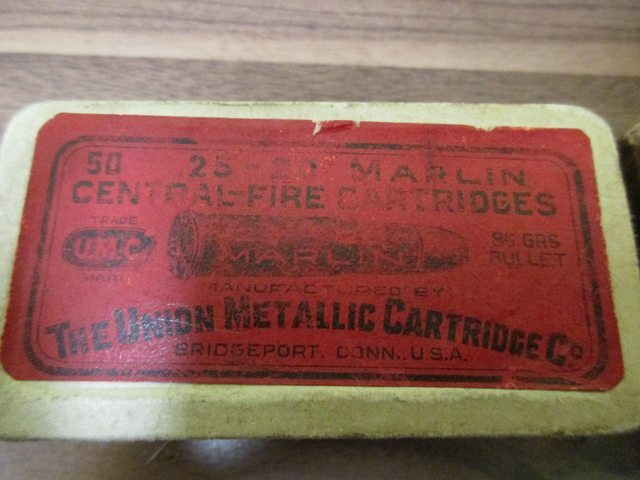 Also came across two boxes of original .25-36 Marlin ammo too! One is a partial box, and the other full. But both correct headstamped brass! Update to the Model '94 project. I had planned to have Al Springer re-case the lever and hammer that were blued. But upon closer inspection I thought the receiver might also have once been case colored as most were. I used some chemical rust remover to strip the hammer and lever, and discovered traces of case colors under the bluing. So I rolled the dice and decided to check the receiver too! Spun the barrel off the action, and stripped down all the parts. Put chemical stripper on everything I wanted removed and discovered someone had blued over case colors without polishing them first! Now these aren't super high end case colors, but too good to have been blued over. I decided to not have the parts color cased now, and reinstalled the barrel, and assembled the gun again. I've recently picked up several hundred .25-20 cases, so I'll proceed with loading for the gun, and getting it out to the range for testing. 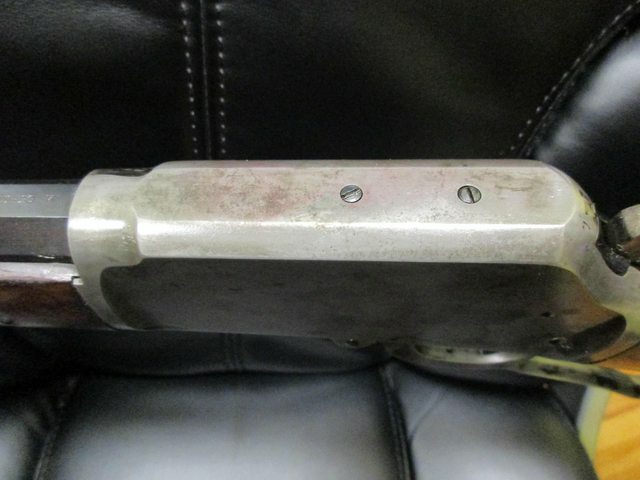 Wish I still had the six cavity mold for the Ranch Dog 259-85GC bullet as I’m kinda sure it might just work in that gun since he used chamber casts from a Circa 1902 Marlin 1894 25-20 I owned when he was working on the mold . Wish you did too! I own an old Ideal mold for an 86 gr. .258" bullet, so will have to cast them one at a time. But found two 100 ct. boxes of bullets, so I'll load them up first. I've got a 60-65 gr GC mould if you want try some lighter bullets. I'll gladly send you some to try. Thanks GM! I've never had much luck with the lighter bullets in my old .25-20 rifles before. I have 2 25-20s, a Savage 23B and my (broken) mini farquesen. The Savage likes the 60- 75 trainers. Of course I have to single load the 75s. The mini farquesen broke before I got to load data. I gotta get motivated to make a new hammer. I used the Lyman 257 forgot last two numbers that dropped a 65ish GC bullet . Loaded around 1000-1200 FPS I got acceptable squirrel killing accuracy from the 1902 1894 and an 1894CL . 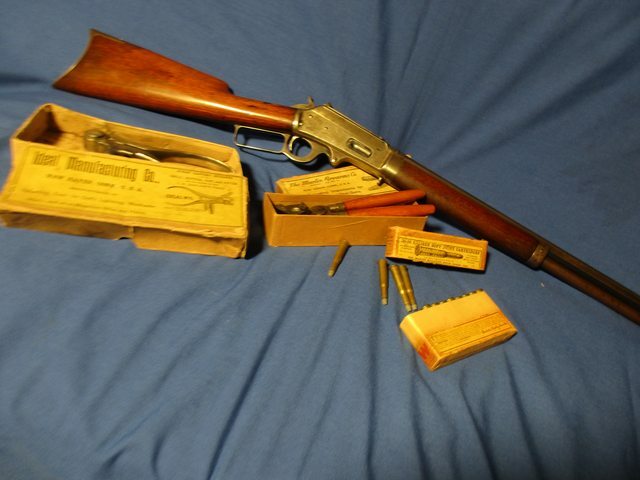 My 2nd year 1893 takedown in .25-36 with original Marlin mold, Ideal tong tool, and .25-36 M. ammo. This one also has a factory installed and serial number matching Whitney-Kennedy sliding trapdoor buttplate. 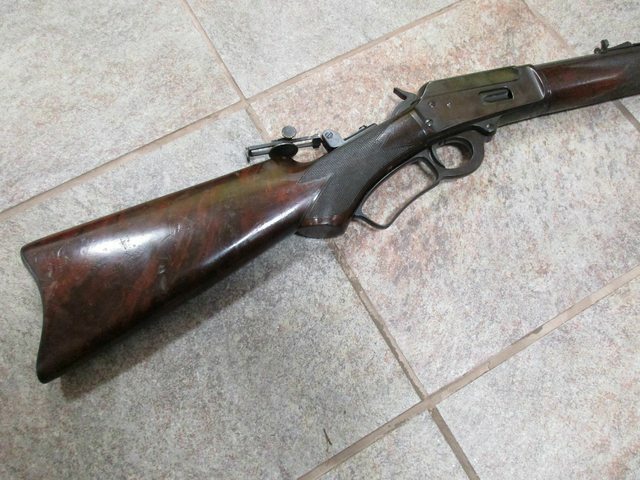 This is the first Marlin lever action rifle I ever bought, and came from the original buyer's son. 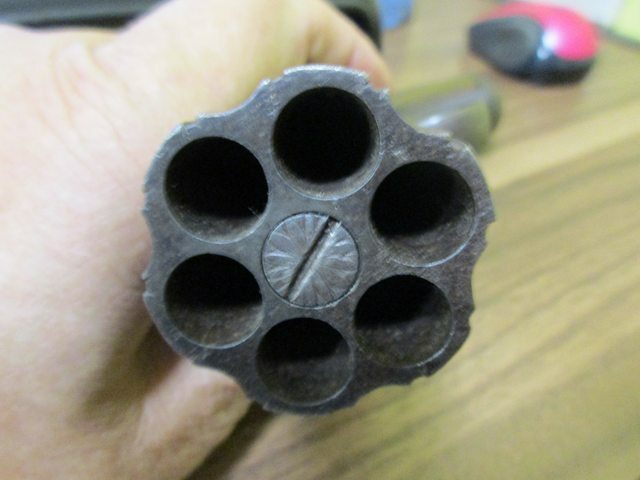 It's a local gun that spent it's entire life in this area. 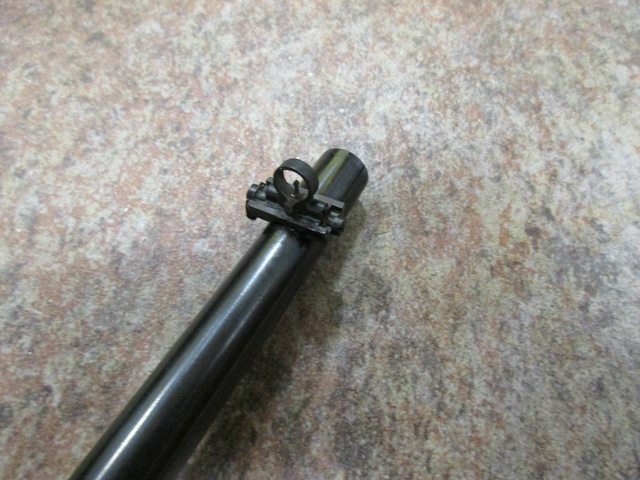 Also has a one of a kind receiver sight, and a Lyman #7 globe front sight. Had 1895'sin .33 Winchester, .40-65, and .45-70. All originals from the early 1900's. Never had one in .38-56, and the others are all gone now. Probably wont go looking for another, but who knows if it popped up like this '94 I might.